I wasn't going to bother posting this one since it's already all over the internet and I had posted a link in the shoutbox when it first leaked, but, goddamnit, I love this band and it would just be strange to me to not have this album on this blog. Longtime readers/listeners of this blog are already aware of my love affair with John Dwyer, and this album only strengthens our bond. I'm not sure if I would take this one over their last, but it's certainly on par in terms of consistency. I desperately need them to come back to DC or Richmond. Your blog is the blog where i would want to download this from. 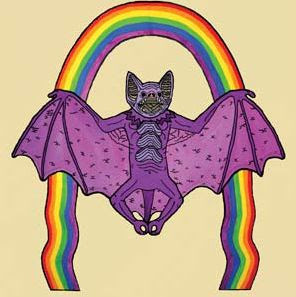 Thanks a lot for this and all of The Oh Sees (& related) you have posted here through the time. I've been turned on to so much awesome new music on your blog. It's the best. Also, since I come from the Twin Cities region, it's heartening to see you covering some of the local scene like Gay Witch Abortion and Gay Beast. Thanks for all the music! No matter what name they are going by at the moment this band is always quality. This record is awesome, can't wait to pick it up in a week.